Al-Kindi (801-873) - The first great figure to come out of the House of Wisdom was al-Kindi. He is called "Philosopher of the Arabs", and is considered the father of Muslim philosophy. He is also the first Muslim peripatetic philosopher in that he modeled his thinking after the teachings of Aristotle. Like Aristotle, al-Kindi was a polymath. In addition to philosophy, he excelled in the fields of mathematics, medicine, astronomy, logic and a number of other fields. Born and raised in Basra, he received his formal education there, and then moved to Baghdad to study at the House of Wisdom. His brilliance quickly caught the attention of the caliph, and he was recruited into his service (he would end up working for several). One of the projects the House of Wisdom undertook was translating the "philosophy of the ancients" (as Greek thought was called) from Greek into Arabic, and al-Kindi was appointed to oversee the task. So he is one of those most responsible for insuring that some of the classical Greek works survive to this day. In fact, he acted as somewhat of a conduit between East and West. In addition to translating Western thought into Arabic, he also introduced Eastern science to the West. 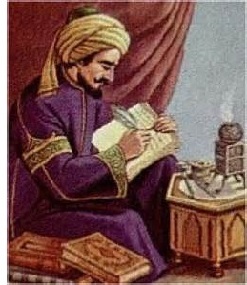 Al-Kindi adopted the numerical system invented by Indian mathematician Brahmagupta (see Brahmagupta), and from there, it eventually worked its way to Europe. Unfortunately, much of his work was forgotten, and some has been lost for various reasons. The caliph who reigned toward the end of his life, al-Mutawakkil, frowned upon non-Islamic knowledge and the House of Wisdom stagnated for a number a years. But much more severe was the Fall of Baghdad (see Fall of Baghdad) by the Mongol Empire in 1258.